Nestled in the foothills of Morrison, Colorado, 20 minutes from downtown Denver, Red Rocks is a geologic phenomenon—an acoustically perfect amphitheatre not duplicated anywhere in the world, a visual marvel of natural rock formations. Today, it ranks as one of the planet’s most awesome and important concert locales. The natural wonder of the Red Rocks setting wasn’t cemented in the imaginations of rockers everywhere until U2 staged a now-famous concert video, Under A Blood Red Sky. However, a lot of things had to go wrong in order for the show to come off so right. In 1980, U2 came through Denver on its first American tour, playing at the now-defunct Rainbow Music Hall. Promoter Chuck Morris knew the young Irish band was destined for greater things and wanted to show off Red Rocks to the members. They immediately fell in love with Colorado’s classy outdoor venue, and manager Paul McGuinness vowed that one day they would film a performance there. Three years later, U2 carried out the commitment when Red Rocks was booked for June 5, 1983. By that time, the college-radio underdogs had made a mark on the rock scene by dint of honest, emotional performances. From day one, the logistics proved to be formidable. No one had ever attempted such a project before, and it was a costly proposition. For the full effect of the mountain scenery to be caught on camera, the huge rocks had to be lit up at a cost of $40,000, according to McGuinness. However, the band proceeded with the lofty plans. Gavin Taylor, the director of The Tube (an avant-garde English video program), was flown over to oversee the filming. Steve Lillywhite, the producer of U2’s albums, was also transported from Europe to properly record the live audio on location. Special effects including backdrops and two bonfires on the rocks were generated. But on the day of the show, miserable weather moved in and threatened to ruin the entire scenario. Temperatures dropped to 40 degrees at showtime, and a day’s worth of drizzle evolved into a deluge. It was no place to be holding a concert, but with all the investment in one show, canceling or moving it was out of the question economically. “The Red Rocks area was in a cloud, a rainstorm,” Bono said. “We’d paid all the camera people’s wages, we’d paid their flights over. We had to go on with the concert. U2 decided to play without a warm-up act for all who braved the weather. They then planned to do a proper show with Divinyls and the Alarm at an indoor venue on the University of Colorado campus the following night. Bono went on the radio—he called local stations KBPI, KPPL, KPKE, KTCL and KAZY. Out of the 6,000 advance sales, 4,400 ticketholders showed up to deal with the nightmarish elements. U2 took the stage despite all of the operational nightmares. “If only eight people turned up, we were still going to play like our lives depended on it,” Bono said. The 19-song show has gone down as one of U2’s defining moments. The event ceased being a concert after the second song. From that point on, it was more akin to a church service, a tangible exchange between a band fulfilling its promise as a premier musical outfit and its soaked, shivering fans. Later, the drama made its way to the wonderful U2 At Red Rocks (a rock documentary aired on the Showtime national cable television service) and Under A Blood Red Sky (a video and live album). The pelting rain and swirling mists that rolled in over the mountains gave the setting a dramatic, eerie quality, something akin to a Scottish moor. The segments in which the band was delivered to the site via helicopter appeared to be from the epic war movie Apocalypse Now. 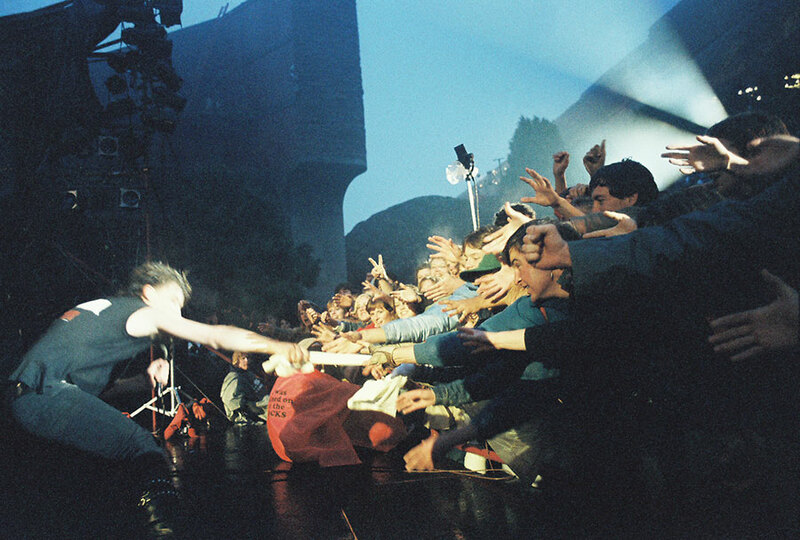 And the concert pieces were exceptionally striking—in the video of “Sunday Bloody Sunday,” Bono immortalized his holy gladiator profile, unfurling and waving a huge white flag in the crowd against the hellish glow of the large, flaming torches high on the cliffs surrounding the stage. It’s doubtful that any other band could have turned the adversity at Red Rocks into its favor so convincingly. The subtle peace-and-brotherhood appeal was attributed to the Christian beliefs that three of the four members shared. “We’re not just ‘sentimental Irish lads’—I think there’s more depth to us than that,” Bono insisted after the show. “We just want to share a message. John Lennon, Bob Dylan—those people were artists who wrote about what was happening in their lives. The mystic, against-all-odds performance was a spiritual and commercial breakthrough, and it turned U2 into A-list rock heroes.